Last week, I was so busy posting peach recipes that I failed to mention the massive bag of cherries I was snacking on in real life. I don’t think we’ll have a full-blown cherry week, but I do have several cherry recipes up my sleeve. Today, I thought I’d share my new favorite summer salad. Seriously packed with flavor, it’s composed of peppery arugula, warm black quinoa, goat cheese, and gorgeous dark red cherries, tossed with an easy balsamic vinaigrette. If you can hunt down cherries before the end of summer, make this salad—you don’t want to wait another year for it! 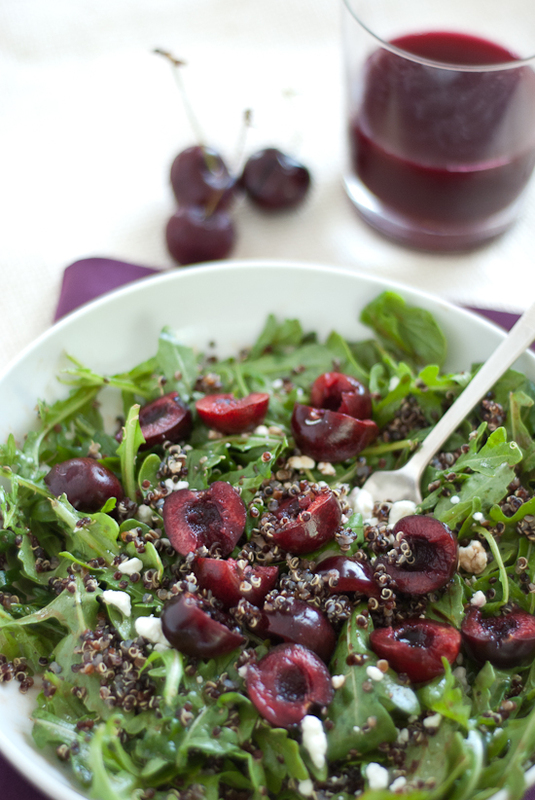 This salad features peppery arugula, warm black quinoa, goat cheese, and gorgeous dark red cherries, tossed with an easy balsamic vinaigrette. 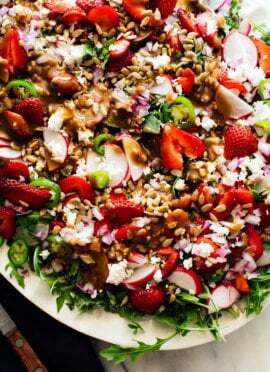 It’s a flavorful, healthy summer salad! Assemble your salad: whisk together the dressing ingredients and toss with several handfuls of arugula. Add slightly warm quinoa, a good sprinkle of goat cheese, and cherries. 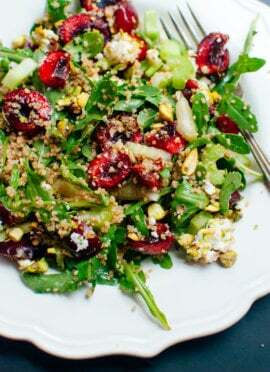 Inspired by Kiss My Spatula’s Wild Arugula-Quinoa Salad with Cherries. Make just one serving: One cup of uncooked quinoa will yield enough cooked quinoa for about 3 or 4 salads. I like to have leftovers around for breakfast, but feel free to use ½ cup quinoa and one cup water if you don’t want much extra. Make it dairy free: Just omit the cheese! P.s. Big thanks to Women’s Health for featuring my peach salsa in their “What We’re Reading This Week” column! Ok, this is eerie! I just posted a very similar recipe this morning… I guess great minds really do think alike ;). Yummm! I’ve never put cherries in a salad but the idea sounds delicious! I’m so impressed with your culinary skills Kate. Those peach mojitos below sound right up my alley! Thanks Kristen! You’re too sweet. Love this combination of ingredients! Black quinoa is fun too. Oh Yum! I need to get my hands on some black quinoa so I can make this stat. This salad is beautiful. I love the way it sounds too! 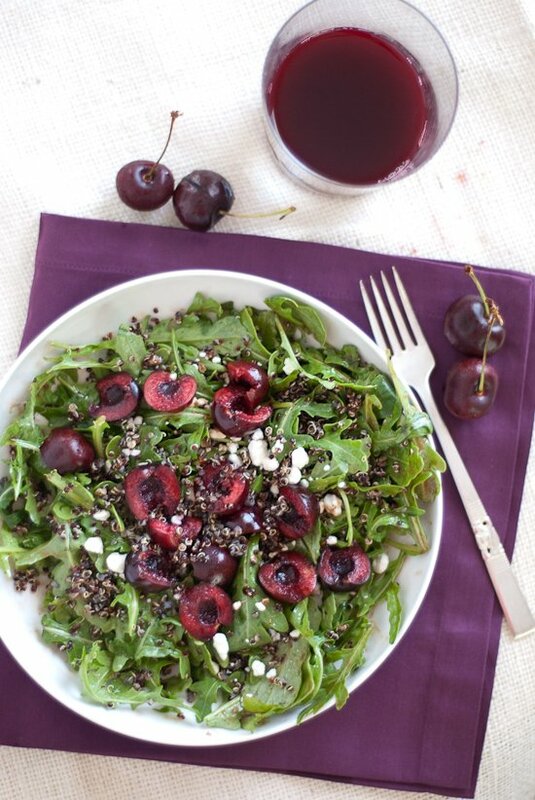 A very different salad and loved the freshness of cherry and loved the addition of quinoa! Great!! 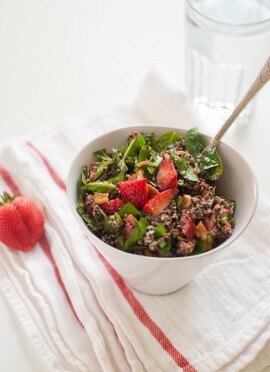 is red quinoa not the prettiest thing on the planet? Looks gorgeous and yummy! Agreed! I much prefer the red and black varieties to the white—they’re prettier and tastier! another great recipe using quinoa, kate! :) its funny that even tho its still winter here, i am beginning to see more and more cherries at my supermarket! i can imagine they go really well with the goats cheese!! this may be the first time i’ve seen cherries in a salad…and i love it. i bet it tastes so great mixed with the goat cheese. i’ve been on a cherry kick all summer. I made a nearly identical salad at the same time as G’s, but used wild rice instead of quinoa. Any kind of grain salad is a winner in my book! Pictures are lovely. Yum, that sounds great! I’m kind of obsessed with tossing warm grains (I need to try wild rice) into salads. They add such a nice temperature/texture contrast. Thank you for sharing my recipes with your Facebook followers! I’m so glad you enjoy my blog. Looks great! I am a vegan but I do want to find something with a similar quality to the goat cheese. (I have tried the Vegan Artisan Cheese recipe, but it’s too hot to make rejuvelac that is any good here in NM in July!) I was wondering if you have a simple suggestion of what to put in the salad that would have the same sort of contrast to the other ingredients. Hmmm. Amy, I wish I had a great suggestion! I’m stumped on this one. Feta is really salty, so in Mexican recipes I recommend adding pickled jalapenos in place of the cheese, and in Greek recipes, I say olives, but I’m not quite sure what would play well here. Sometimes a little bit of mellow white miso can take a recipe over the top, so you could try adding just a tiny bit to the dressing? Maybe?